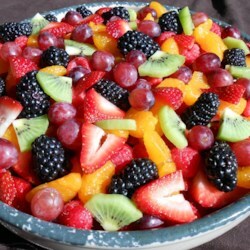 This is a really solid go-to fruit salad. I prepared it for Thanksgiving. It would work just as well for summer picnics. One cautionary note: I added some raspberries, which don't hold up well. In fact, they fall apart. So if you make your own choices about fruit, avoid raspberries.